The left has been running around with torches and pitchforks ready to destroy a group of Catholic teens for an awkward response to a leftist protester — and they doxed a random kid in the process. Now, his family is receiving violent threats — and he wasn’t even there. 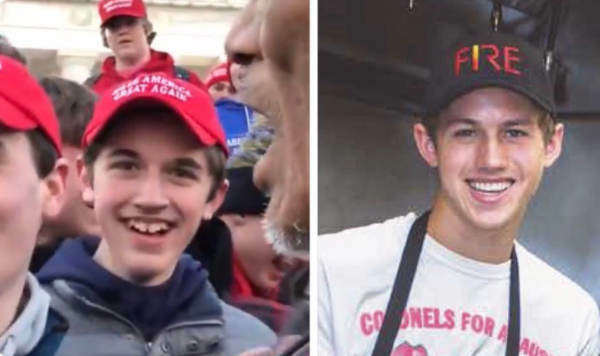 Soon after the incident, people began spreading photos of a teen named Michael Hodge — believing that he was Nick Sandmann, the teen who was confronted by the Native American activist. There are hundreds of tweets with his name, photos, and personal information about him and his family. In their rush for blood, the left attacked this random teen. On Sunday, the teen’s older bother, Andrew Hodge, took to Twitter to explain what his family has been going through since the mob began attacking them. “Yesterday was supposed to be a day of celebration for my middle brother Alex, who got married last night. Instead my family had to deal with the fallout of my youngest brother #MichaelHodge being falsely accused for standing & smiling in front of an indigenous man with a drum,” the older brother wrote in the first of a series of tweets. “People then proceeded to spam my family with harassments and threats of physical violence. We then find out our parents address was posted online. If that wasn’t enough, our family operated business has been slandered and attacked,” he continued. Hodge explained that his little brother is “the best kid I know” and volunteers for the Special Olympics. “You condemned my parents for being horrible role models, yet you jumped to conclusions and were ready to string up an innocent dude?” Hodge asked. Hodge finished his statement by urging people to hold themselves to a higher standard and be better. “We will all be better off for it,” he concluded. Kentucky Prosecutor Rob Sanders, Twitter avatar On Sunday, Rob Sanders, a Kenton County Prosecutor, fired a warning shot to leftists threatening acts of violence against Covington Catholic High School. Mr. Sanders represents the 16th Judicial Circuit in Kenton County and he made it very clear acts of violence will not be tolerated. “Threatening acts of violence against educational institutions in Kentucky is a felony and we don’t take it lightly no matter the circumstances. #KYcrime” Rob Sanders said in a tweet. The left wing media erupted this weekend after students from Covington Catholic High School were targeted with a smear campaign when deceptively edited videos of the children were posted to Twitter. The frauds in the mainstream media are starting to backtrack their stories after video surfaced of the whole incident involving the Catholic teens and the Native American activist, proving the teens were framed. But the damage is already done. The Catholic minor students are now in fear for their lives after Twitter allowed a hate campaign to proliferate unabated. One of the Native American protesters who confronted the Covington High School students has admitted that he knew that black nationalists were harassing the kids when they joined them “in solidarity. "The Native protester, Marcus Frejo, also “liked” a video on YouTube from notorious antisemitic Louis Farrakhan. As the Gateway Pundit reported in our interview with students who were present and their parents, a 14-year-old student said that they were simply waiting for their school bus and doing chants when they were confronted. “We were standing there when a group of four African-American protesters started calling us ‘crackers’ and ‘school shooters,'” the student told TGP. He also explained that they told one of our African-American students — who is one of my friends — that when he gets older we will harvest his organs, which is insane.” Frejo knew this was happening, as he admits in the post — yet he has the audacity to claim it was the students who were racist. “When we were singing you could hear the learned bigotry, you could hear the mocking, the laughs, the hate, the racism and as I looked around I thought who taught these kids to hate, who taught them to be this way, who taught them to disrespect an elder in this way,” Frejo wrote. This is where it gets good, in an update to his post, Frejo acknowledges the homophobic and racist things that the black nationalists, who he repeatedly referred to as his brothers, were saying to the children. “Even though the hebrew Israelite brothers said some disrespectful things that I heard earlier on during our rally, I still put that aside and wanted to help. Thats their teaching, we have ours and thats what makes us equally beautiful. The only way we can ever get to know eachother is to sit and visit, to eat together, spiritual align and then we become friends. Friends that could uplift eachother in our different beliefs. To sing, to bring that good spirit into a chaotic situation, maybe the world will see and feel that this is yet another teachable moment for all humanity. If the walls of division dont come crumbling down within the hearts of people how can we ever unite. This is a teachable moment for the youth. The earth is talking. The power of those drums. The sun is shining and the sacred mother moon is coming. Cleanse your spirit. Breathe,” Frejo wrote. So, to sum it up — the Native American protesters were standing with open bigots against children that they thought might possibly be bigots because of their hats. Seems reasonable. Media Frenzy. As first released, the video did look damning, and the leftstream media was in hog heaven berating the young men involved. They did so largely as a vehicle for condemning President Trump, the right, pro-life people, and Catholics—many of the left’s boogeymen, in other words, so they had a lot at stake in this narrative and apparently didn’t bother to find out the whole story before running with it. First the Fury, Then the Facts. And yet. The full story has given a lot of people on the left and right pause. Maybe these kids weren’t the bullies but were, instead, the pawns of activist bullies attempting to leverage them into the role of political pawns. Pawns played by the left to undermine not only President Trump but every right-leaning conservative person in the country.